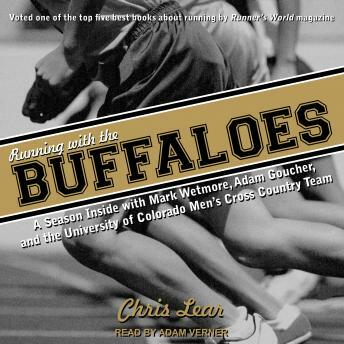 In Running with the Buffaloes, writer Chris Lear follows the University of Colorado cross-country team through an unforgettable NCAA season. Allowed unparalleled access to team practices, private moments, and the mind of Mark Wetmore-one of the country's most renowned and controversial coaches-Lear provides a riveting look inside the triumphs and heartaches of a perennial national contender and the men who will stop at nothing to achieve excellence. The Buffaloes' 1998 season held great promise, with Olympic hopeful Adam Goucher poised for his first-ever NCAA cross-country title, and the University of Colorado shooting for its first-ever national team title. But in the rigorous world of top-level collegiate sports, blind misfortune can sabotage the dreams of individuals and teams alike. In a season plagued by injury and the tragic loss of a teammate, the Buffaloes were tested as never before. What these men managed to achieve in the face of such adversity is the stuff of legend and glory. With passion and suspense, Lear captures the lives of these young men and offers a glimpse of what drives a gifted runner like Adam Goucher and a great coach like Mark Wetmore.